The basic construction of the Maxiform S-Twin is identical with the one of the Maxiform. However, with the S-Twin, the surfaces on both sides consist of two birch face veneers each. 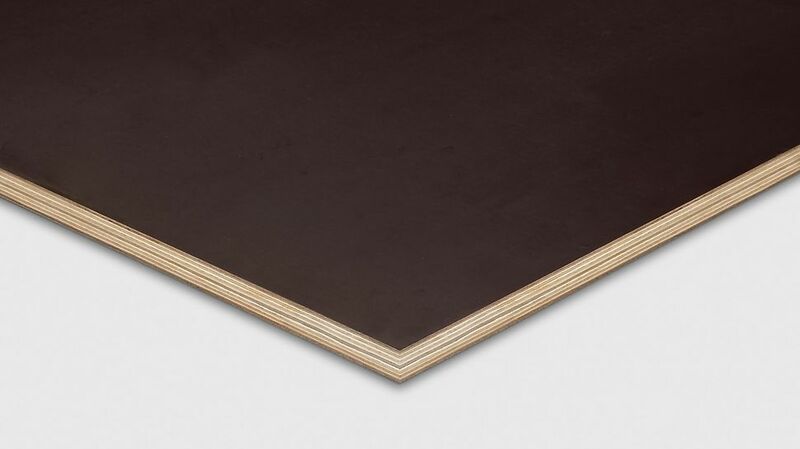 Due to the harder surface, the panel is more resistant and this reduces marks from reinforcement; and a higher number of utilisation can be achieved. The surface is also coated on both sides with 220 gr/m² phenolic resin coating. The inherently stable panel construction also here ensures homogenous behaviour during concreting as well as easy cutting of the panels. The Maxiform formwork panel is our alternative to blockboard or laminboard panels, with the advantages of a veneer plywood panel: high dimensional accuracy, evenly-spread stability as well as good processibility. This panel is mainly used in concrete prefabrication factories. The wbp-bonded formwork panel consists of poplar plywood throughout and is coated on both sides with each 220 gr/m² phenolic resin coating.